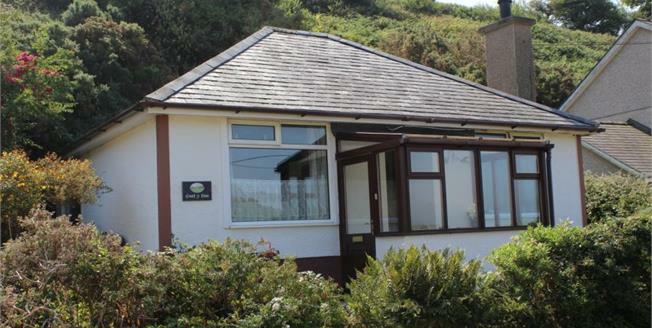 A very pleasantly situated 2 Bedroom detached Bungalow of individual design lying to the approch road into this delightful village some 1 mile from the highly acclaimed seaside village of Abersoch. The property is within a conservation area and an area of outstanding natural beauty, set within its own established gardens together with part of the natural hillside behind, private off road parking. Beautiful distant views across the countryside towards Ynys Enlli ( Bardsey Island ). Very comfortable and compact accommodation with the benefit of oil fired central heating anddouble glazing throughout, offering a sun room entrance, through lounge, /open plan Kitchen and dining area with fitted units and feature local stone fireplace to the lounge. bathroom off, Rear Porch,2 double bedrooms and loft room via slingsby style ladder. Note : To the rear lies a small cave some 18ft in depth. This is beleived to be part of exploration work around WW1 when miners were seeking metal ores. Llanengan has an ancient stone Church founded by St Engan in the 6th century and is on the pilgrims route to the Bardsey Island Abbey. A community centre and the renowned Sun Inn public house with the Surfing Beach of Porth Neigwl closeby.